In addition to the items on this page, other items can be turned such as handles, drawer knobs, gallery rails and tableware. Kitchen support columns and decorative turnings can be made to your specifications, and in the timber of your choice. .Fluting, reeding and twisting can be applied to the columns. If you need to support a large Island unit worktop why not go for one of these. 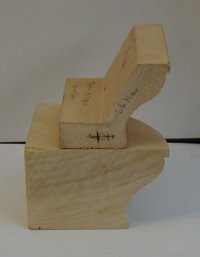 They can be turned in Oak, Ash, Elm, Black Walnut, Yellow Poplar or Pine. They are large enough to be used as a single support for even the heaviest worktops. 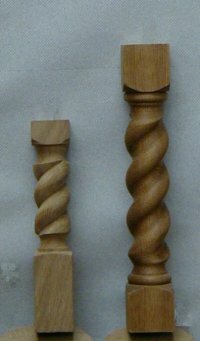 Twists turnings can be made, for use as legs, gallery rail components or decorative shelf supports. Cornice moulding sections can be matched in the round, enabling round cornered cornice instead of angular mitred sections. 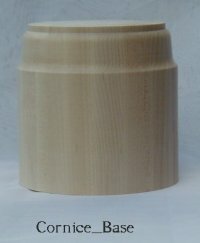 can be made in quarter, half or full round sections, they can be capped with cornice moulding sections. They can be plain, twisted, reeded or fluted. 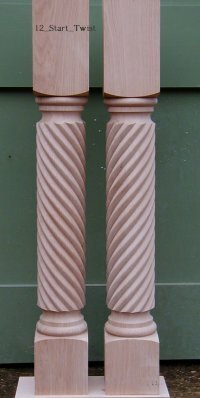 Above: Split turning half column. 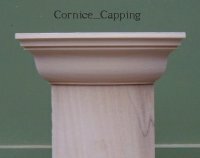 Decorative Column Bases can be made in quarter, half or full round sections, they can have turned base sections, in quarter, half or full round sections.